7.62x51mm, also known as 7.62 NATO, has been in service longer than almost any cartridge in the U.S. Military and rightfully so; 7.62x51mm has proven its effectiveness over and over again from the hills of North Korea to the roof tops of Iraq. Having seen use as a carbine round in weapons like the FN FAL and more recently the Mk 17, a medium machine gun round in weapons like the M240 and Mk48, and as a precision sniper rifle round in weapons like the Army’s M24 and the Marine Corps M40, 7.62x51mm has more than solidified its place on the battlefield. While the U.S. Military replaced this round during Vietnam with the smaller 5.56x45mm as the primary service rifle round, it continued to stay in service in many other roles, and we continue to see it come back into play as a service rifle round today in places like Afghanistan where engagements regularly take place beyond the effective range of 5.56 NATO. While some complain of the heavy recoil of 7.62x51mm, modern muzzle brakes and suppressors almost completely address this issue, with many rifles in 7.62x51mm being produced today even with barrels as short as 13” being very pleasant to shoot, some even describing them as comparable to 5.56x45mm. Modern technology combined with proper training in recoil management allows 7.62x51mm to be an extremely modular round, able to accomplish almost any mission. 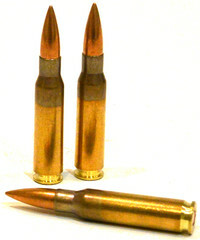 7.62x51mm is also one of the most common calibers in the world, with countries on all inhabited continents having some use for the round. No matter where you are in the world, someone nearby has 7.62x51mm, making this an ideal caliber for a military or hunting where resupply is not a guarantee. 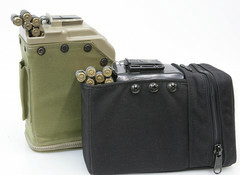 Bullet weights for 7.62x51mm vary widely, from the Mk 319 SOST (Special Operations Science and Technology) round loaded with a 130 gr "barrier blind" bullet deigned for use in 13" barrels, to the M80 medium machine gun round loaded with a 147 gr FMJ, or the M118 LR with a 175 gr Sierra Match King bullet ideal for use in sniper rifles. With such variety available, there is sure to be a 7.62x51mm round that meets your needs.